Plans to reestablish a military presence in the Mediterranean aim to stabilize the military and political stability in the region. 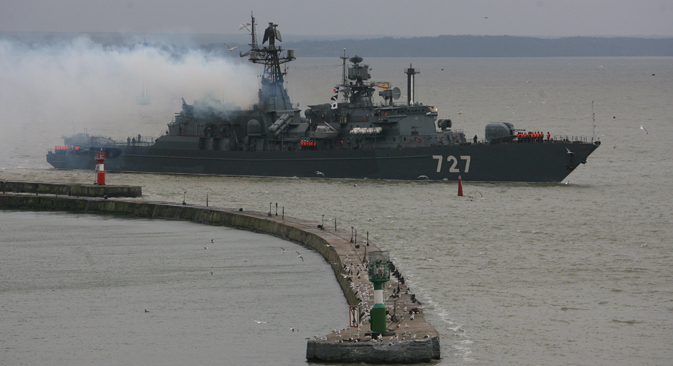 The Russian Navy is planning to reinstate in the Mediterranean the squadron it dissolved 20 years ago. Its presence should become a stabilizing factor for the region. “We are planning to assign five or six vessels and support ships to the formation from this year. They will rotate from each of our fleets in the Black Sea, the Baltic Sea, the Northern Sea, and in some cases even the Pacific. Depending on the scope and complexity of our missions, the number of vessels in the formation could increase," said Commander-in-chief, Admiral Viktor Chirkov to RIA Novosti. Chirkov also told the news source that the squadron could look forward to submarines. “It’s possible – in the future. They used to be deployed there at the time of the Fifth Squadron. There were nuclear- and diesel-powered submarines there. Everything will depend on how the situation develops." According to the Admiral, the Navy Command is also considering including Mistral-class helicopter carriers as staff vessels for the squadron. A Russian squadron in the Mediterranean is a symbol of the rebirth of Russia’s military might, according to Andrei Frolov, Editor-in-Chief of Eksport Vooruzheny (Arms Export) magazine. “Creating such a formation makes sense because its vessels could be used in case of a crisis in the region and also as a launch pad for sending ships further afield – to Somalia and other parts of Africa. Our sailors are familiar with Tartus, which has the necessary infrastructure for vessels to fuel up and restock on water while the crew rests," Frolov told Kommersant. Vladimir Batyuk, a military expert with the Institute for U.S. and Canadian Studies, believes that the idea of establishing the squadron could only be viable if the situation in Syria, its intended home base, becomes stable. Batyk shared that he believes "a permanent strengthening of the Russian Navy in the Mediterranean will be perceived with understanding. An overwhelming majority will treat the Russian Navy’s presence with understanding, because it will stabilize the military and political situation there. Russia maintains constructive and even friendly relations with some of those countries." On the other hand, Irina Melkumyan, a professor at the Russian Academy of Sciences’ Institute of Oriental Studies, believes that the appearance of a Russian squadron in the Mediterranean could cause anxiety in some of the region’s countries. “I think this is probably ill-conceived. I believe Russia should not become the object of criticism from the region’s countries once again, because Russia’s position is known to diverge from those of the Arab League, Turkey and, of course, Israel. Most Middle Eastern countries have a different position, and right now such a step by Russia will only worsen the situation and weaken Russia’s position in the region,” she said. Based on reporting by Kommersant, RIA Novosti, and the BBC Russian Service.